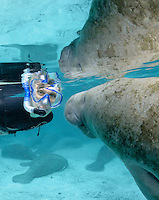 Passive observation of manatees in their natural habitat, no touching or disturbance by people on snorkel or in kayaks. Crystal River and Homosassa are the only places in the USA where swimming near manatees is legal. Rescued and rehabilitated manatees are released regularly in the springs, complete with tracking buoys.